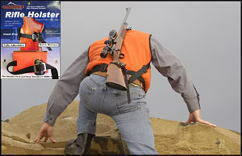 "Modern Technologies with Pioneer Spirit"
The Gunslinger Corral's famous Rifle/Shotgun Holster, the Quick Adjust Rifle Belt & the Universal Backpack Attachment. Holsters available in Black, Camouflage or Orange. *Left Handed models available in Black only. *Belt is 65 inch cut to size. 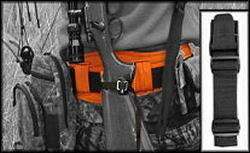 *Standard Rifle holster fits any belt up to 2 inches wide. Set valued at $60.93 - SAVE $10 bucks with this Package! 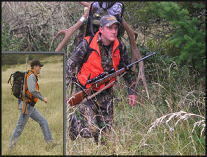 -Fully Adjustable to fit most Rifles and Shotguns. (Factory set to a Rem 700 or Savage rifle). -Attach to a belt or Pack's waist strap *Universal Backpack Attachment" may be required for effective "side" and "front carry" positions. Fits up to 2 inch belts. Satisfaction Guaranteed! -Fully Adjustable to fit most Tactical Rifles and Tactical Shotguns. (Factory set to a Rem 700 or Savage rifle). -Attach to a Duty Belt or Harness waist strap *Universal Backpack Attachment" may be required for effective "side" and "front carry" positions. Fits up to 3 inch belts. Satisfaction Guaranteed! -Designed with CQB in Mind, This simple clip will secure your Mossberg 500 (or like weapon)while leaving your hands free! Also GREAT for multiple weapon deployment or non-lethal in addition to primary. - Fits up to 3 inch web gear. Most tactical weapons. M4, G36, MP5, Breeching Shotgun and similar. Satisfaction Guaranteed! Attach to the Shoulder Harness of ANY Back Pack, Suspender or Vest. Providing use of the Gunslinger Holster in a "Side" or "Front Carry" Position (Holster Required). Made with high quality nylon webbing and equip with a quick adjust/quick disconnect buckle, the Gunslinger Backpack Attachment will come in handy for many uses. Designed to quickly attach to any Shoulder Harness. One size fits all, Cut to Size. -Designed to fit OVER your Winter Gear. Heavy Duty Nylon Webbing with a Quick Adjust Buckle. Make rapid adjustments in the field without removing the belt. A Tool-Belt for the Hunter. This Belt is a favorite with the rifle holster. Don't forget the suspenders. SHOP SAFE ONLINE------ NFPUSA.com "Modern Technologies with Pioneer Spirit"
And all of our products have a 100 percent money back guarantee !